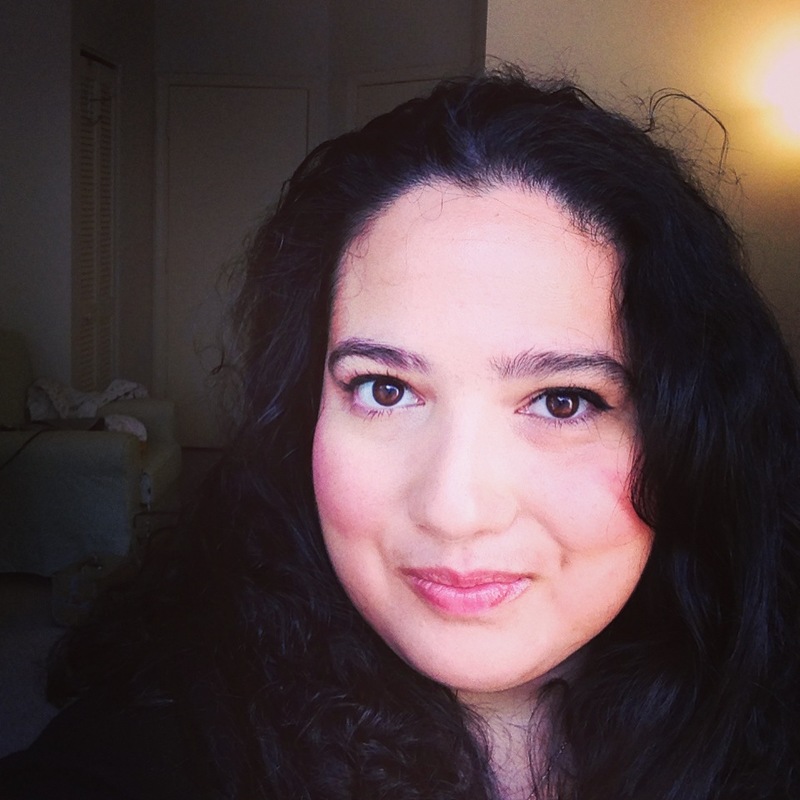 The holidays are pretty much behind us and it’s time to look to the year ahead. 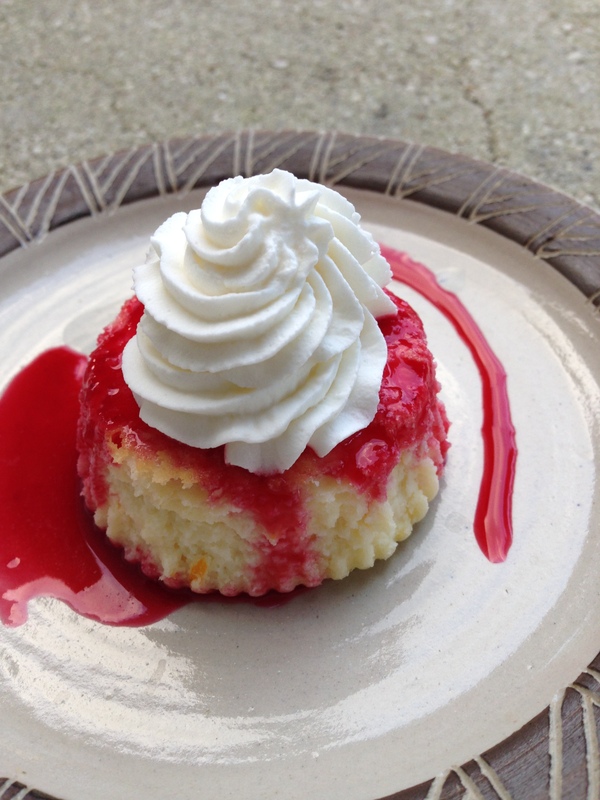 This year, I want to share more savory recipes and as I looked to rid myself of the last of the sugars laying about the house I came up with a dessert that will likely be my go-to whenever I am hosting a dinner. 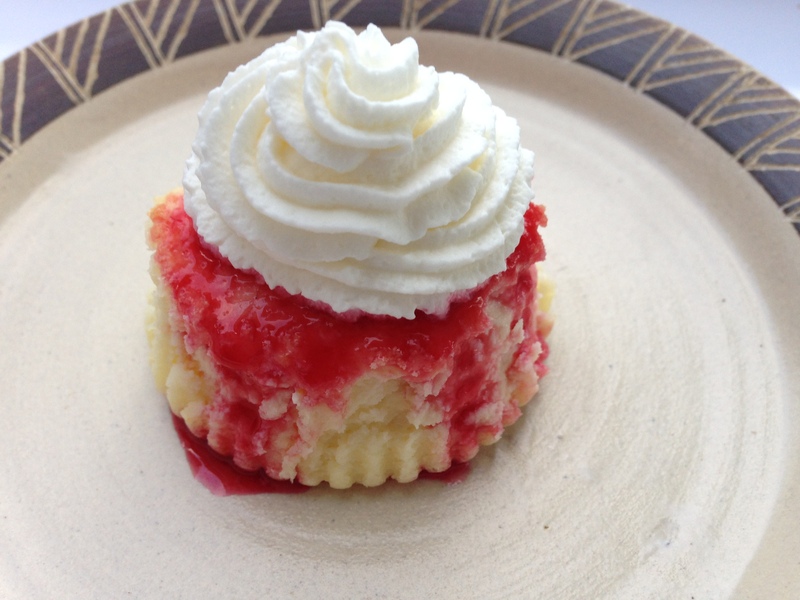 I love cheesecake, it’s rich, decadent, and refreshing. I had two bricks of cream cheese in the fridge and what better way to use them up than to make cheesecake batter and pour it into a lined cupcake pan? The recipe is simple and all of the ingredients are gluten-free (or can at least be found gluten-free). The end result is a beautiful dessert that you will be proud to share. Preheat your oven to 325F. Beat the cream cheese using the paddle attachment of your stand mixer, you can also use a hand mixer (if you have strong arms you can even do it by hand with a wooden spoon). Once creamy and smooth, add the sugar and cream together. It is important that the cream cheese be at room temperature otherwise you will have a lumpy batter. Add the eggs one at a time and mix until combined. Add the vanilla extract and orange zest and mix until incorporated. Pour into lined cupcake pan. Depending on how much you fill them you should be able to fill 12 slots. Bake at 325F for 15-20 minutes. 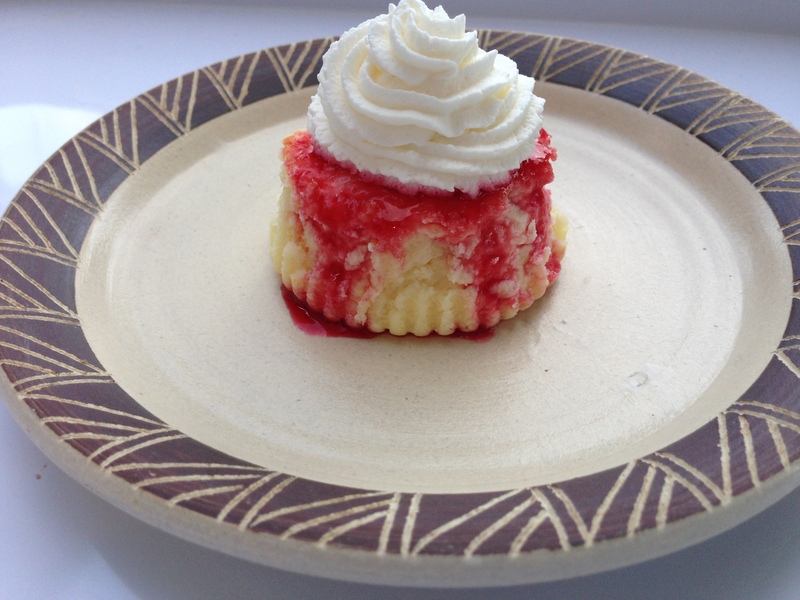 You want the cheesecake to be almost set in the middle but still wobbly. Turn off the oven and allow to cool for about 5 minutes before removing from the oven and setting on a cooling rack. The cheesecakes will deflate a little. Allow to cool completely before placing in the refrigerator for a couple of hours. The cheesecakes are already wonderful as they are but I had some frozen raspberries I wanted to use up so I threw them into a saucepan along with the juice and pulp of one orange. I also added about a quarter cup of sugar and a teaspoon of vanilla extract. Then I added a generous splash of champagne. I brought it all to a boil and simmered it for a few minutes until it had reduced a bit. At this point taste your sauce and add a little more sugar if you feel it needs it. I wanted the sauce to be fresh with a hint of tartness, not sickly sweet. I then strained the mixture and discarded al the seed and pulp. I returned the liquid to the stove and simmered until it thickened a little. Once I was happy with the consistency I turned off the heat and let the sauce cool in the pan before transferring it into a bowl and placing it in the fridge. Carefully, remove the cheesecake from the cupcake wrapper. Place upside down on a plate. This conceals the sunken top part and gives you a flat, smooth surface on which to spoon your sauce. Top with as much sauce as you want and top with fresh whipped cream. I recommend taking the first one you plate up as a little chef’s treat, practice your presentation on this one and modify your approach on the others. Never made your own whipped cream before? It’s easy. You need really cold heavy cream and a really cold bowl. I place mine in the freezer for a few minutes. Whip the cream until it’s stiff enough to pipe. You can add vanilla extract and powdered sugar if you want. These can be plated a few hours in advance and kept in the fridge until you’re ready to serve. It is no secret that I love to bake. I love cooking in general but baking is what I love to share most. Desserts are a great treat. I love them. As I’ve gotten older I have found that I don’t enjoy the sweetness of most commercially produced desserts. A lot of foods I used to enjoy now feel sickly sweet to my palate. This is one of the many reasons I love baking from scratch. The treats I make are always just sweet enough. Last night, I was in the mood for some cheesecake and so I set out to make my own. This crustless cheesecake requires only five ingredients and the ones it omits results in less calories while still being delicious. Mix the cream cheese, sugar, and eggs until smooth. Zest your lemon and add as much zest as you would like. 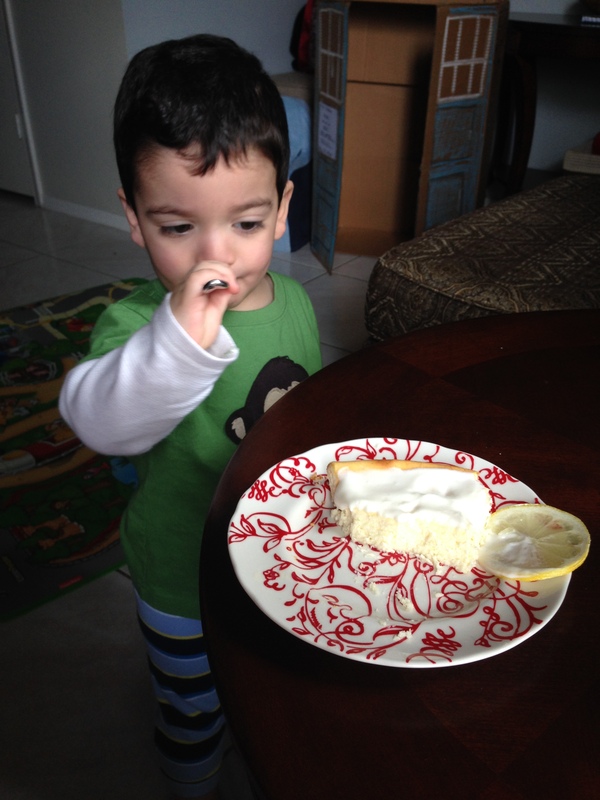 I zested about half my lemon and used that. 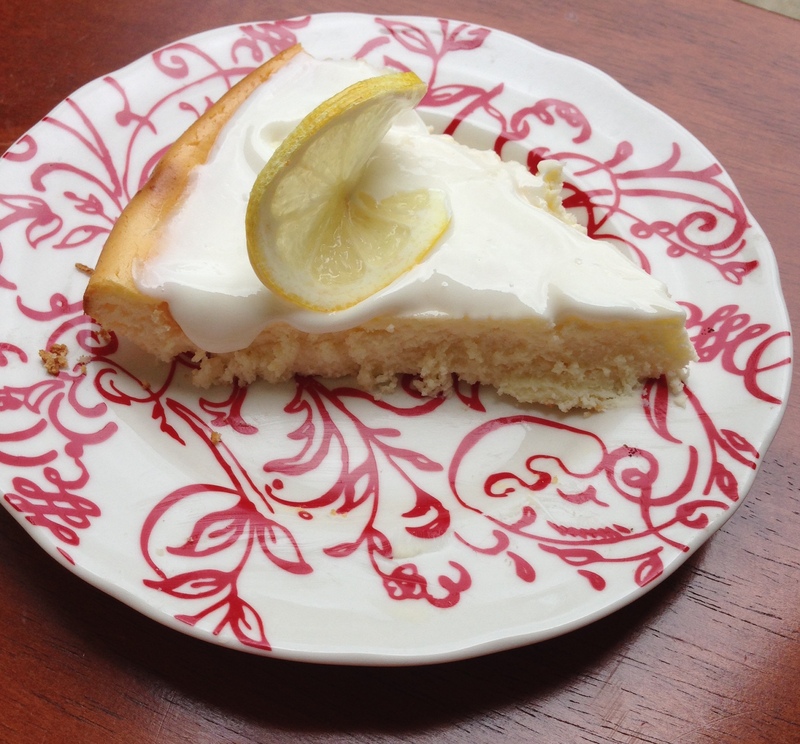 I also squeezed out about half a teaspoon of lemon juice. Add the zest and juice to the mixture. Add a quarter teaspoon of almond extract or vanilla extract. Pour into 9 inch glass pie dish. Bake for about 30-35 minutes. Edges should be golden brown. 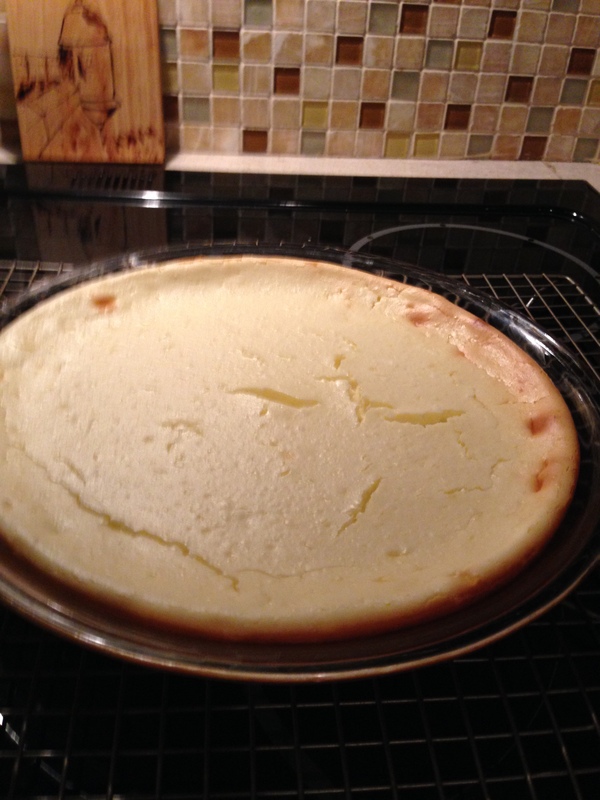 When you remove from the oven the cheesecake may be a little puffed up. It will deflate as it cools. Leave it to cool on a wire rack until it reaches room temperature then refrigerate for at least 4 hours before serving. Welcome to Cookie Thursday, a new monthly series that will feature a new cookie recipe one Thursday a month. It should come as no surprise that have a sweet tooth. I try to keep it in check but it often gets me in trouble. Take tonight for example, I was sitting at home thinking about baking when I remembered a jar of almond butter I had sitting in the pantry. Could I make something with it? I immediately went to Google and as I typed in my search query I decided I would attempt to make the first recipe I clicked on. I came upon Sally’s Baking Addiction and her Almond Butter Chocolate Chip Cookies recipe and immediately headed to the kitchen. This simple 5 ingredient recipe was a cinch to make and the results were amazing. I am definitely going to be making these again. What’s more, I did not miss the flour or the butter one bit. To me, the cookies taste just like regular chocolate chip cookies. 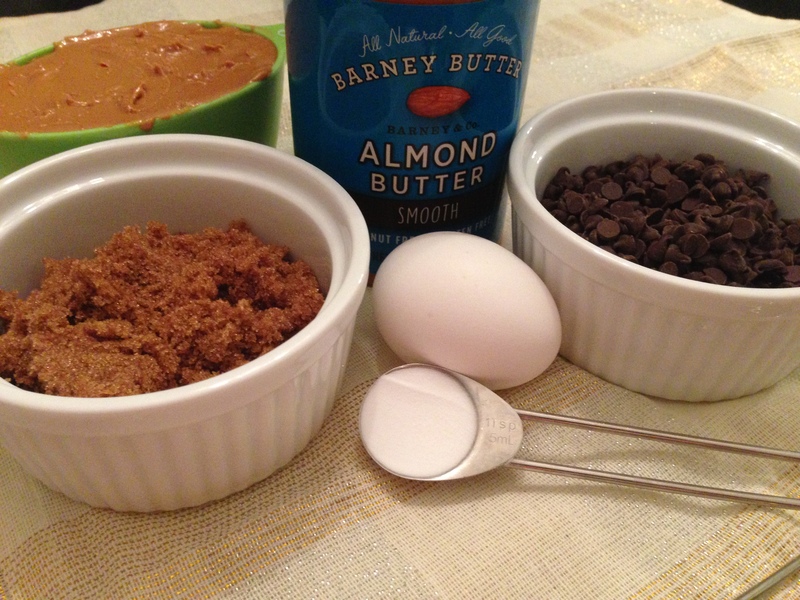 In a bowl, combine the egg, almond butter, brown sugar, and baking soda. Add vanilla extract if you’re choosing to use it. Mix well using a stand mixer, hand mixer or wooden spoon. The almond butter is very thick so if you choose you mix by hand you will definitely flex those muscles. 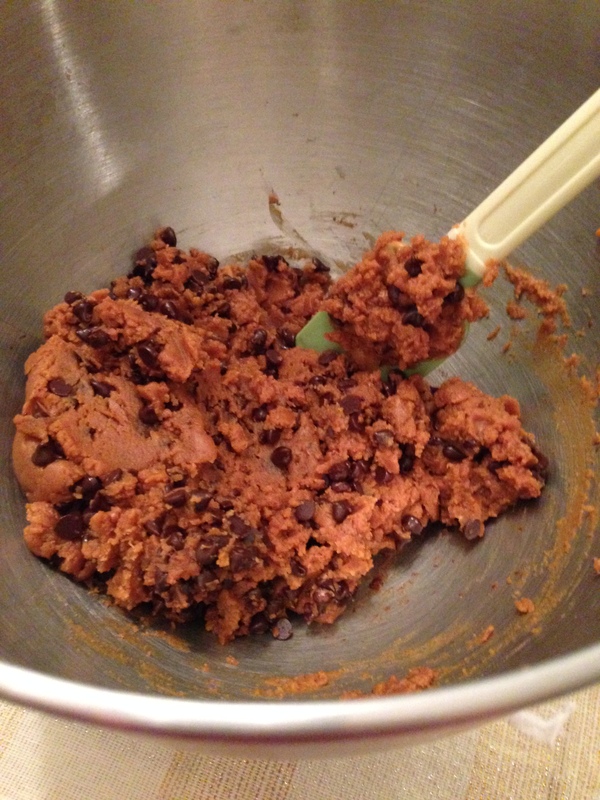 Once all of the ingredients are incorporated add your chocolate chips and combine. I decided to make smaller cookies so I spooned about a teaspoon and half of batter per cookie. I flattened them out a little with the back of a spoon. 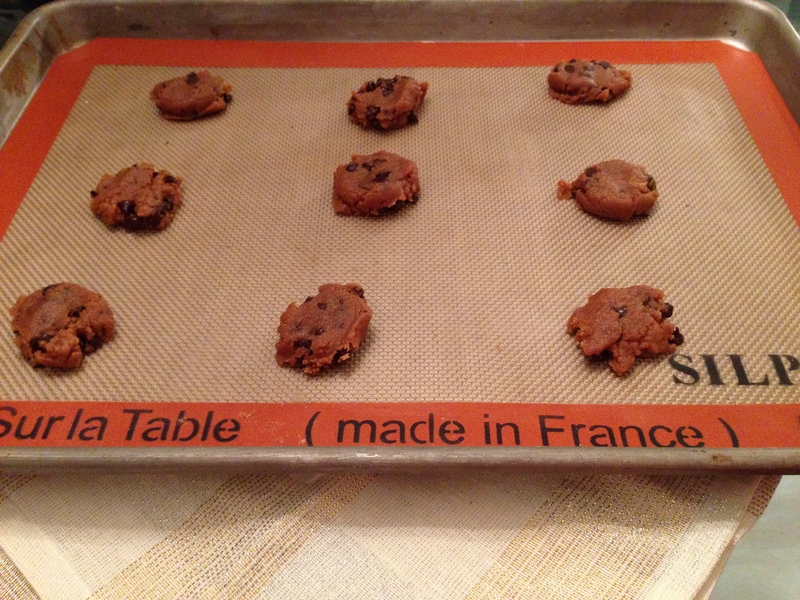 Bake for about 8-10 minutes and leave to cool on the cookie sheet before setting on a wire rack. I got about 30 cookies out of this recipe and even though they’re small they are the perfect size in my opinion. After calculating the caloric value for all ingredients used it works out to about 70 calories per cookie. Not bad for a cookie made with whole ingredients! Unrelated, but I believe that eating real food is best. I do not eat reduced fat or reduced calorie anything. Fat is good, it keeps us full longer and a lot of flavors are fat soluble. It’s why low fat foods are injected with chemical nasties- to make up for the loss of flavor that occurs when the fat is removed! This is the first gluten free recipe I’ve ever made and I have to say I am pretty impressed. Although I have no medical need to eat gluten free I am very excited to try out more recipes. 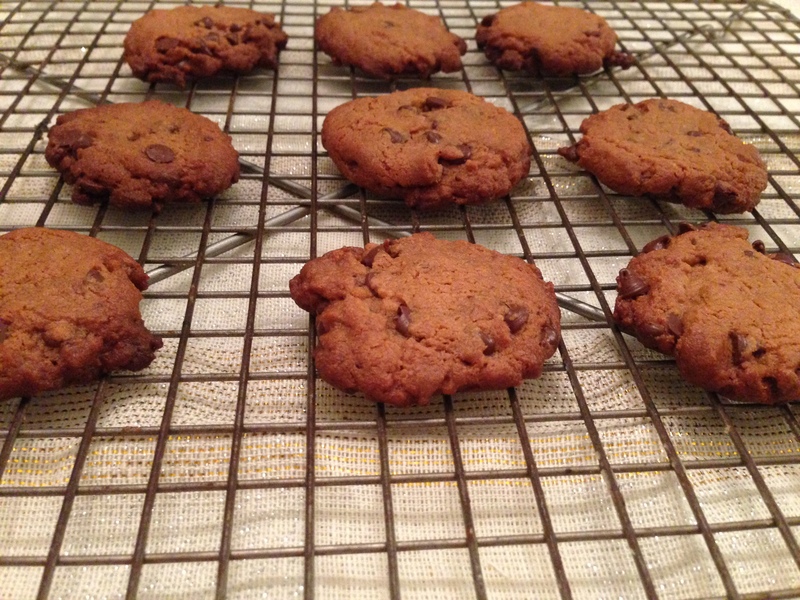 Posted in Recipes and tagged almond butter, baking, chocolate chip, cookies, gluten, glutenfree on June 12, 2014 by abbydlr.